For the English cricketer, see Austin Carr (cricketer). For the American football player, see Austin Carr (American football). ^ "Cavaliers All-Time Roster" (PDF). NBA.com. Retrieved August 8, 2007. ^ "25 Greatest Players In College Basketball". ESPN.com. Archived from the original on February 8, 2008. Retrieved February 14, 2008. ^ "ND Basketball: A double shot of T-Jack". ndsmcobserver.com. Archived from the original on May 23, 2009. Retrieved February 22, 2008. 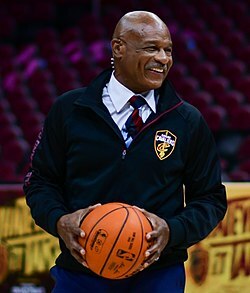 Interview with Austin Carr, recorded July 22, 2014, at Cleveland Public Library's Sports Research Center by Dan Coughlin.